Harriet: What you doing in here? Cato: Ain't this Ms. Georgia room? 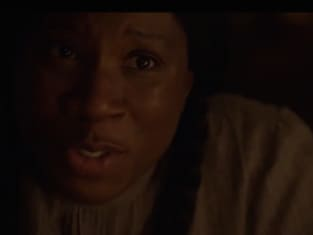 Harriet: Naw, I just tidy up from time to time for Ms. Georgia. Now that's two questions of yours I answered and I only asked you one. Cato: There's this woman. She was sweeping floors, but she matches the description of Harriet. Patty: She's the most notorious slave stealer there is, and you think she is sweeping floors in her down time? Cato: What happened to you? Elizabeth: They shot my husband in the head right in front of me. The world made sense, and then in the blink of the eye, it didn't. I'm still grieving and I'm still furious. Elizabeth: Fear. It's the only thing that's been constant since they shot John. The idea that they could...knowing that they can do, have done and will do what they want. Elizabeth: In...or out. I'm not sure which is better. Cato: Pull it in then push it out. Get so scared you gotta scare them back. Become the monster that came to eat you. Elizabeth: He kidnapped me and tied me to a tree. Georgia: And I wish that hadn't happened to you. I do, but it could have been worse, a lot worse. You walked out of those woods alive but if it had been me...You wanted to know why I pass? It's because a sense of safety transforms the spirit. Look, it's got you thinking you're invincible. Georgia: Maybe not, but any retaliation threatens the safety of the runaways who come through our station and that has to be our priority. James: Now I'm my own massa. Noah: I don't... I don't know. I just believed. Harriet: And that's what you done lost. That feeling that impossible things are possible. You gotta find it. This war we fighting need men like you. Noah: Stop. Stop lying to me. Just stop lying. You sat right there, right there. You let me put that ring on your finger, and I went 600 miles wondering what I did to make you so distant. What did I do? This whole time you didn't want me touching you 'cause you was hiding. You was willing to sacrifice our family for yours! Permalink: You was willing to sacrifice our family for yours! Noah: You ain't give me no choice. Rosalee, you treated me like a slave! Noah: You just like your father. Permalink: You ain't give me no choice. Rosalee, you treated me like a slave! Daniel's Daughter: They gon sell us too, Daddy. They gon split us up. Daniel: I ain't gon let that happen. Daniel's Daughter: What you gon do? Daniel: I don't know yet. Permalink: They gon sell us too, Daddy. They gon split us up. Excuse me, sir. Can I help you? Permalink: Excuse me, sir. Can I help you?